The transport in Malaga is quite comfortable and in the city centre you can see practically all the main sights on foot, as they are all around the historic centre. The bus station in Malaga , which is situated next to the Malaga train station, is from where run busses to many places in the whole province (www.estabus.emtsam.es). The network of buses from Malaga city is extensive and most lines are operational from 6:45 AM to 23:00 PM. There are also 3 night buses to help you get home after a few drinks. The train service in Malaga and all of Spain is run by RENFE, the Spanish Railway Company. In the new train Station Maria Zambrano passengers can buy train tickets to Seville, Madrid, and a variety of other destinations. Other popular option is to hire a car in Malaga. Price is cheaper than using a taxi for moving within the city, Hiring a car will bring us freedom in our trips. Either way, if you come to Malaga by AVE or by airplane to Malaga airport, if you want to visit other places it is better to plan well in advance if you want to save much money. Once you are in the historic center of Malaga city, all things of interest are in a nice walking distance. The Picasso Museum, the bustling nightlife in Malaga and most tourist hotels are nearby. It also only requires a short walk through the Paseo del Parque to reach the beach of La Malagueta. Malaga has to be enjoyed step by step, enjoying every typical corner and every street. If you are an early bird, you can visit the highest and most emblematic point of the city, the Gibralfaro. You can either walk up here or leave your car in the car park of the Parador de Gibralfaro. To your feet lies the Malaga coastline, between the early mists. From here you can see the sun rise on the eastern coast and you can savor in the distance how the city wakes up to welcome a new day. To gain some strength, you can take a coffee in a terrace of the Parador. If you want to visit the castle, you can take your time, as it will open at 9 AM. If you are visiting Malaga by car, afterwards you can head towards the Paseo Maritimo, towards the city centre. A good place to park the car is the Paseo de la Farola, mainly because it is an ideal place to enjoy a pleasant walk along the sea and the port while it is still morning and the sun is not scorching yet. The Paseo del Parque is the real heart of the city, with many fountains and subtropical plants. You find the park close to the entrance to the main pedestrian street of town, Calle Larios. The tranquility of the historic center of Malaga where there are no cars, makes it even more enjoyable. Alternative routes in Malaga city include a new section from Malaga town hall with 6 thematic tours to discover the city walking. On the official tourism website www.malagaturismo.com you can plan your routes through maps with information, photos and videos and you can download maps. If you feel like a different means of transportation, you can as well opt for a guided tour through Malaga by horse and carriage. The ride takes about 45 minutes and runs through the historic city center. The local suburban train consists of a single line, whose final destinations are Malaga and Fuengirola. The train makes 15 stops between the main resorts along the western Costa del Sol, as for instance Torremolinos and Benalmadena. It departs every 30 minutes, from 6:30 h to 22:30 h.
However, if you want to explore further ahead you will need a good means of transport which takes you right to the heart of the place to visit. The west coast, which runs from Guadalmar to Fuengirola is well connected both by train and bus. The hassle starts beyond Fuengirola, as the train does not go to places like Marbella and Estepona. Moreover, the interior villages like Mijas and Ronda are connected only by bus, and the distance, waiting times and the discomforts of the curves are a drawback of this means of transport. The Eastern coast is even worse, in the direction of Velez and Nerja there is not even a train. On the other hand, the province is well connected by road. Towards Marbella runs the old N-340 and the A-7 motorway, while to the other side, towards Nerja runs the same highway A7. 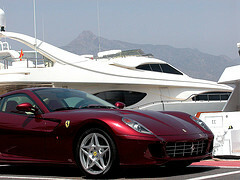 Therefore, in order to tour the province, I recommend rent a car in Malaga. In Malagacar.com, for example, they have their facilities next to Malaga airport and courtesy cars to pick you up. If you feel like a getaway to another city, here is the approximate distance and travel time by car from Malaga city. Ronda: 117 km (1 ½ hours); Antequera: 53 km (40 minutes); Fuente de Piedra: 71 km (50 minutes); Nerja: 76 km (45 minutes); Torremolinos: 17 km (12 minutes); Benalmadena: 25 km (20 minutes); Marbella: 59 km (45 minutes). And if you want to do a longer excursion through Andalusia, here are some more distances: Seville: 212 km (2 ½ hours); Huelva 305 km (3 ½ hours); Cordoba 160 km (2 hours) and Granada 134 km (1 ½ hours). Parking near the cruise port?